Are you looking for a great gift or for an experience of a lifetime? Xperience Days makes it easy! Xperience Days is giving away a $75 voucher towards the unique Xperience you want to try. This giveaway is hosted by The Megalomaniac Mommy with help from The Sci-Fi Daddy, Just Becki, Ms Panda, MomAnthology, Supermom on Wheels, and Super Mommy to the Rescue. You can enter to win this awesome giveaway by completing the Rafflecopter form below. I won a great little stamping set and some other Crafty Secrets giveaways from Pam at Iris Garden. Here is a quick project I put together for a little celebratory mini-card. For the "uncle sam" tyke image I stamped and embossed twice in blue ink, colored both with Spectrum Noir markers and cut one of the images. I am still learning the techniques of coloring with alchol markers so this was good practice. I then layered the cut image over the full image using foam squares for a 3D effect. The Celebrate 4th stamp was stamped and then embossed with red glitter embossing powder. The circle was aged using blue ink and Spectrum Noir and Le Plume markers, then lightly sanding. I also cut out a Star Spangled Banner image from a holiday stack by Tim Holtz. The images were placed and layered on blue card stock left over from THIS PROJECT. The edges were trimmed with borders and a embossed square and star brad. I also added hemp for a mixed prim - vintage -glitzy look. Fun! I also played around with my Cricut - the above images were created using the Florals Embellished cartridge. LOVE the images..... I just need to get a better handle on what tension to use with what varying types of paper / cardstock as a couple of the pieces tore on the more intricate cuts. I have embellished these further with rhinestone accents and look forward to posting a couple of projects, once finished. Until then...happy crafting! It has been years since my girls were little and a lot has changed in that amount of time- especially baby products! I cannot believe all of the new car seats, toys, gadgets, etc. I was recently able to review the FreshFoods Mash and Serve bowl. This is such a great product and I wish they had it when my girls were babies. The set is made from a material that makes gripping easy. It looks like a bowl and pestle but is lighter weight and the masher has a larger, slotted surface. 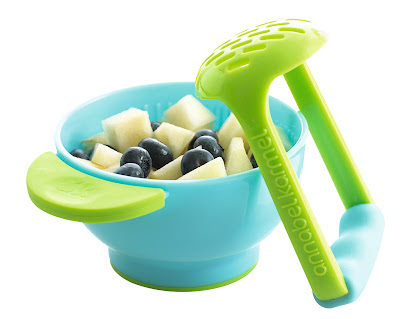 The bowl has rubber "footing" at the bottom to make in non-slip. 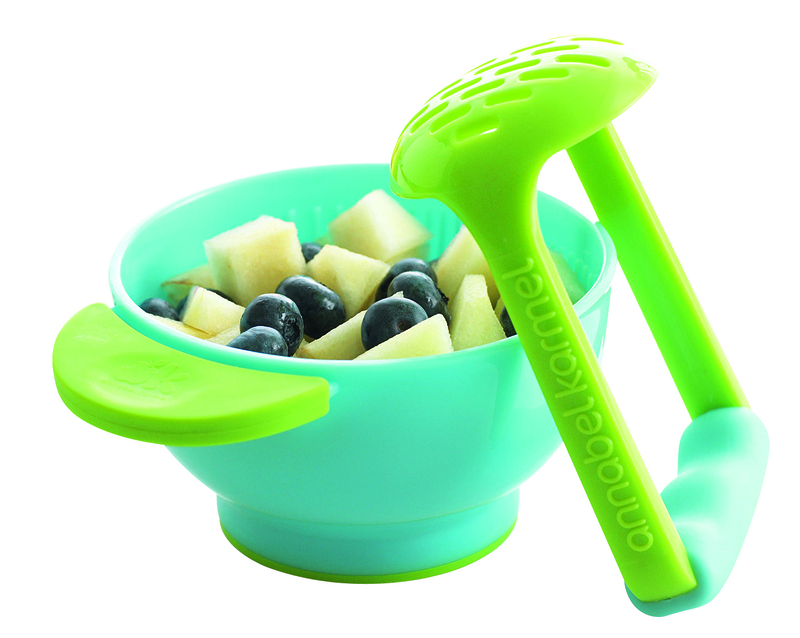 It is lightweight enough to be portable but solid enough to act as both a food prep utensil as well as dining bowl. The FreshFoods Prep mash and serve bowl is microwave safe and is a breeze to clean. This is quick, easy and you don't have a ton of pieces to wash like you would if using a blender. One lucky winner will win a FreshFoods Mash and Serve bowl. - share via twitter, facebook or other and post the link. Giveaway will close in two weeks (07/08/2012 at 11:59 pm EDT) Winner selected at random. Must be 18 or older and a permanent resident of the US. Good Luck to ALL! Disclosure: I received a product for review purposes. I did not receive any form of monetary compensation for this post. Looking for a more adult snack? 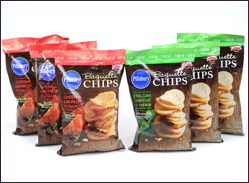 Look no further....Pillsbury knows just how you feel and wants to awaken your taste buds with their new PillsburyŽ Baguette Chips! These are mini slices of bread, thinly sliced and baked to a delicious crisp. They are hearty in texture and in taste. Topped with savory seasonings the flavors of Italian Cheese & Herb and Cheddar Sun-dried Tomato should keep your taste buds satisfied. The delicious flavors and perfect texture of these crispy chips can help you round out any recipe and are especially perfect for Hors d'oeuvres. Enjoy Pillsbury Baguette Chips for a wide range of occasions: eat them alone, add a bit more flavor to your favorite dip, spice up soup, or add some crunch to your salad! Perfect for appetizer dishes. My girls LOVED LOVED LOVED these. We received 6 bags to review and they were gone within 3 days. I at least was able to try some :) It was funny because I immediately opened the sun dried tomato variety and Miss N. opened the herb and cheese but I ended up preferring the herb and cheese and she liked the sun dried tomato better. I do have 6 bags to share with one lucky reader. Please comment on this post of which variety you think you would prefer. Winner to be selected at random. Receive an extra entry for following me for each channel (twitter, facebook, or google friend connect/google plus) - just post a separate comment with the name you follow under. If you share on facebook, twitter or Google plus please leave another comment. Giveaway ends 7/8/2012 at 11:59 EDT. Good luck to all! Today's challenge from 365Cards is Nature. 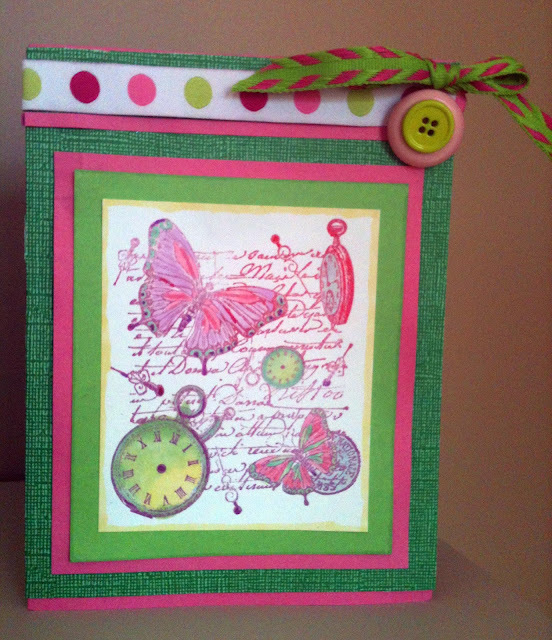 Here is a card I created with a butterfly theme. 3 different inks were used to stamp and heat-emboss the image. Once cooled the image was colored using Spectrum Noir Markers. The stamped image was matted onto smooth kelly green and carnation pink card stock and then matted again onto textured pure green card stock. The top was trimmed with the pink card stock, ribbons in two different patterns and buttons. I decided to take on another daily challenge at 365Cards. The theme today was Music. I knew I had some music note paper and embellishments. I selected papers with depth due to the rich red and blue hues and intricate design, with texture or with a simple music note theme. I cannot wait to see tomorrow's challenge. Now that I have an art studio I have been in creation mode! A fun little thank you note! Scrap paper from various manufacturers - Apricot hounds tooth, cross hatch aqua, 3 different papers in Swiss polka dot pattern (mustard, apricot and aqua), striped paper and cream card stock. Floral pieces - Created from stamp punches (square tag, scalloped flower, large daisy, medium 5-petal floral, small daisy, and tiny floral), secured with a brad and highlighted with Stickles glitter. edges aged using Spectrum Noir Markers. Placed horizontally at the top of the page over an aqua strip and under die cut "Friendship" tag centered by flower rhinestones. Large tag - Created on cross-hatch aqua paper using Spellbinders labels extra large die (cut and embossed). Thanks Tags - Cream card stock stamped in 3 different shades of aqua for ombre effect,then embossed using clear embossing powder. Glazed over using Tattered Angels glimmer paint and edges were "aged" using a Spectrum Noir markers; Corner punched and threaded with aqua wires, embellished with pearl and crystal beads. Tags matted on apricot Swiss dot cardstock and "hung" from floral embellishments. Edited to add: Because of the color palette and summery theme, I am also submitting to http://www.charismacardz.blogspot.com/ and http://www.craftspotbykimberly.blogspot.com/ Summer challenges! I recently completed a simple and affordable project I have been working on. These tiles can be used as coasters, wall decor or display plaques. It is slightly time consuming but the results are completely worth it. This is pretty simple to make. Squares of paper and felt were cut to the size of the tile. The felt was glued on the back of the tile with the glue gun and the edges trimmed with scissors. The paper squares were stamped in various designs using black ink and embossed. Once complete the paper was slightly distressed using Vintage Photo and Antique Linen Distress Ink Pads by Tim Holtz and a stamping blender. The paper was coated with Mod Podge using a sponge applicator - this did make the paper bubble in a couple of areas so a brayer was used to smooth it down. Once the Mod Podge dried, the tiles were sprayed with an acrylic sealer. A sampling of the finished tiles can be seen up close below. I made these for my mother and MIL (late mother's day gift), but will plan to make some for our home as well.